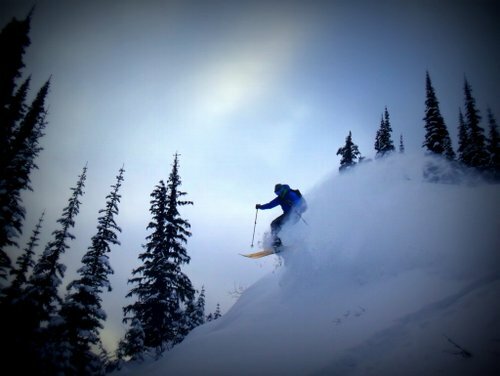 Powder pillows (Pic – Elise). With a low snow-pack the Rossland Range can be oh so tight and bushy. Up till now I’ve mostly been sticking to the ski-hill, or travelling further afield for better conditions. Regardless, today we headed out to Field of Dreams for a look see. We found 10-15 cm of light snow on a firm base in exposed areas, but there were plenty deeper turns to be had, the thickets of Alder were impressive but avoidable, and the ski out was better than usual. We are headed to Red next week on Wednesday after going to Whitewater for 3 days earlier in the week. How bad is the snow situation? Should I dramatically increase my wine and beer budget, or is there skiing to be done? Thank you for the blog.